Though the actual Air Force One is kept at Joint Base Andrews, a full-size 747 replica of the famous plane will soon go on display roughly 10 miles away at National Harbor. WASHINGTON — Though the actual Air Force One is kept at Joint Base Andrews, a full-size 747 replica of the famous plane is now on display roughly 10 miles away at National Harbor. The exhibit is part of the Children’s Democracy Project. On Monday morning the plane made its way from Mt. Vernon to the National Harbor on a barge along the Potomac River. “It’s a teaching aid to help children understand about democracy, using how the presidents travel as a means to explain it to them — everything from [George] Washington on his horse all the way through trains and carriages and up to Air Force One,” said Ross McLaren, of HLI Rail and Rigging, which is the company tasked with getting the Boeing 747 to National Harbor. 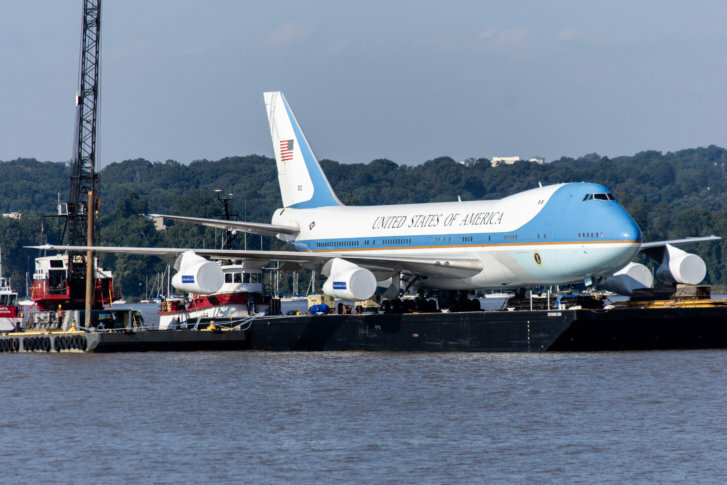 The plane has traveled by barge from Rhode Island, which is where it was revamped into the model of Air Force One. Visitors can expect to see artifacts from the pre-flight days of past U.S. Presidents George Washington and Abraham Lincoln on display, along with items used by presidents who traveled by air. “[John F.] Kennedy’s original seat from Air Force One is there,” McLaren said. The plane is expected to arrive at National Harbor Monday, Oct. 1, between 6 a.m. and 10 a.m, but the “Air Force One Experience” will not open until Oct. 19. It will stay at National Harbor through the holiday season.